If your hunting knife isn’t sharp enough, it’s essentially useless, right? We know you need the best hunting knife sharpener. Plenty of knife sharpeners exist on the market, we’ve saved you hours of research to determine which deliver on quality while others fall short. No Panic! We’ve done the hard work by compiling a list of the best products. Read through our article and pick the one you like most. We also discuss key features that will help you make the best choice. We can ensure your knife will never go blunt again. Read on to find the best knife sharpener for you. 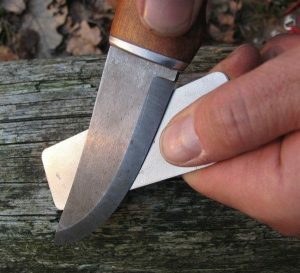 What Is a Good Knife Sharpener for Hunting? There are many considerations when selecting a tool. Additionally, there are numerous types such as stand-alone, electric, and manual. When it comes to functionality, there are three stages to knife sharpening and it is important to understand how many stages you want. The first stage does the bulk of the work from getting your blade from blunt to sharp. The second includes a finer grain to smooth out any areas from the first stage. Finally, the third stage is the finishing touch that will refine the edges and get rid of any debris from the previous two stages. Get the measurements right. Let us say your knife has a bevel on either side of the blade, you need to sharpen each side at a 20-degree angle. That is why you need a tool that can ensure the best angle for knife sharpening and produce excellent results each time. Weight becomes a factor while on the go. If keeping weight to a minimum is important to you, a whetstone may not be the right option. Carrying a whetstone around in your bag will no doubt weigh you down. Regardless of which of the best hunting knife sharpener you choose from this list, you are guaranteed to experience clean and smooth results. 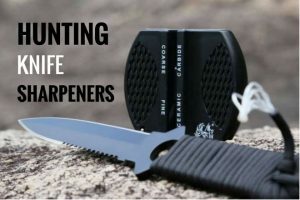 Even if you have top-rated hunting knives, they’re useless if they’re not sharp, so you need the best hunting knife sharpener to stay ahead of your game. It’s no easy task finding the right sharpener since what works for one knife may not work for another. So, to assist you, we’ve reviewed 10 of the best hunting knife sharpeners on the market. Smith’s PP1 Pocket Pal Multifunction Sharpener is a good knife sharpener for those who are on-the-go who need something small and easy to handle. There’s a tapered diamond rod for sharpening both serrated and standard edges. Ceramic edges provide a smoother finish to already sharp blades. This pocket-sized sharpener is lightweight and slim for easy carrying in the field, and it features a 90-degree angle for the sharpener and a 23-degree angle for flat and serrated edges. 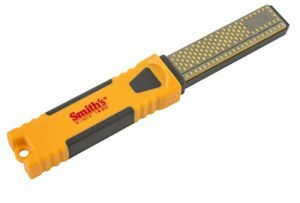 Smith’s PP1 Pocket Pal Multifunction Sharpener is a great slim tool to bring when you don’t have much room that can sharpen serrated and standard edges. The AccuSharp 001C Knife Sharpener is a classic and takes about 10 seconds to use whether you need it for your knife or other hunting cutting tools. 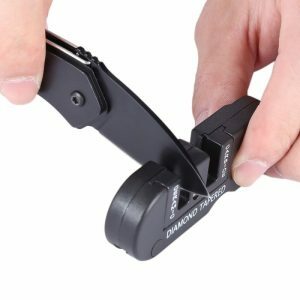 It’s a recommended knife sharpener for those who need something that fits in either their left or right hand. In addition, you can reverse the blade to extend its lifespan. This can be held in either hand and has an ergonomic handle with a full-length guard for ease-of-use and protection. AccuSharp 001C Knife Sharpener is made from quality material with a reversible blade for long-lasting use in addition to an ergonomic handle with an ambidextrous hold. With the Work Sharp WSKTS-W Knife & Tool Sharpener, you get a powered knife sharpener backed by an abrasive belt power sharpening system. This system offers precision for those who require it. Also, it features an angle guided retractable honing rod that aids in field sharpening—a necessary feature on those long hunting days. This powered sharpener features precision and interchangeable sharpening guides for consistency, and it has two angles: one for kitchen knives and one for outdoor knives. 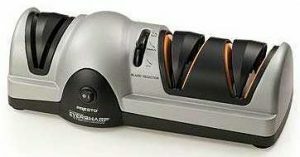 Work Sharp WSKTS-W Knife & Tool Sharpener is fast power sharpener that keeps a quality edge for a good amount of time. Sharp Pebble Premium Knife Sharpening Stone 2 Side Grit is one of the closest you can get to professional knife sharpening tools. If you’re concerned about safety on the field, this can help ease concerns thanks to the silicone base to hold the stone inside and the non-slip bamboo base. It uses water for minimal mess. This double-sided stone comes with a single angle and is professional-grade, and it features a non-slip design for safety purposes. 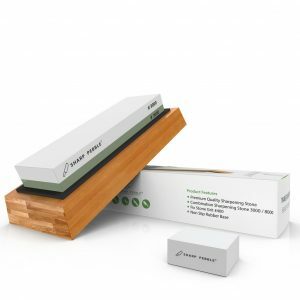 Sharp Pebble Premium Knife Sharpening Stone 2 Side Grit is easy and safe to use, and it features an angle guide and requires water rather than oil. Another quality electric hunting knife sharpener is the Presto 08810 Professional Electric Knife Sharpener. It features a three-stage sharpening system. In addition, it has an interchangeable blade guide to help achieve better sharpening angles. With a three-stage system, this electric sharpener can get you professional-quality sharpening and is adaptable thanks to the adjustable blade selectors. Presto 08810 Professional Electric Knife Sharpener grants you a three-system design with multiple settings and sharpening levels. 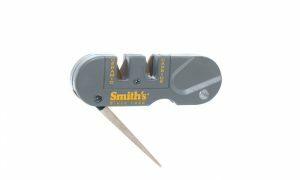 The Smith’s CCKS 2-Step Knife Sharpener is a great knife sharpener for those looking for something easy to carry. It’s only just bigger than a lighter, so it won’t take up room in your hunting gear if space is an issue. There are ceramic rods for a razor-sharp finish and carbide blades for a quicker edge. 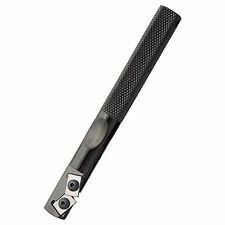 This is compact and easily fits in your pocket or bag, it weighs little, and offers pre-set cutting angles. The use of non-slip rubber feet allows you to set it up and use anywhere. Smith’s CCKS 2-Step Knife Sharpener is perfect for those who need something light and simple to pack up while offering an easy-to-use feature. Work Sharp Guided Field Sharpener is made from durable material to survive wherever your hunt takes you. This sharpener for knives features two angles and five abrasive steps for a complete, professional-grade sharpening system. The ceramic honing rod can rotate to expose both coarse and fine surfaces, while a second rod is used for serrated blades. This pocket sharpener is simple to use out of the box with self-contained elements and a compact design to take with you anywhere on your hunt. Work Sharp Guided Field Sharpener has five abrasive steps for thorough sharpening and a compact pocket design that’s durable. 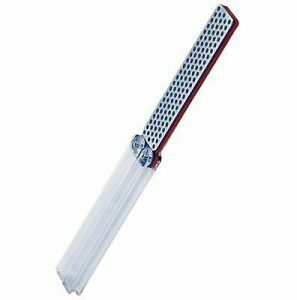 Smith’s DCS4 4-Inch FINE & COARSE Diamond Combo Sharpening Stones is a quality mechanical knife sharpener that’s easy to use. It features a thumb guard and a soft rubber grip for your comfort. The stones have a micro-tool sharpening pad as well as a sharpening groove used for your additional hunting tools if versatility is what you need. Pocket-sized and lightweight, it’s easy to carry around, and the soft rubber grip makes it simple and comfortable to hold. Smith’s DCS4 4-Inch FINE & COARSE Diamond Combo Sharpening Stones are simple to use and carry, and it features coarse and fine stones for versatility. DMT FWFC Double Sided Diafold Sharpener Fine/Coarse is a top-rated compact professional grade knife sharpener. It features convenient handles that fold to protect when you’re not using it, an ideal trait to keep it from being exposed to various elements. Also, no oil is needed for those who enjoy mess-free sharpening. Lightweight and easy to use, this requires no oil so it makes no mess as you can sharpen dry or use water. It’s pocket-style to fit in anything you’re carrying. DMT FWFC Double Sided Diafold Sharpener Fine/Coarse features two sides for versatile sharpening as well as foldable handles for protection. Gatco 40001 Carbide Pocket Sharpener is made from long-lasting aluminum and tungsten carbide. It’s simply a sharp knife sharpener that’s compact, safe, and quick. The material is even corrosion resistant so you’re sure it can survive frequent outside use in various weather conditions. 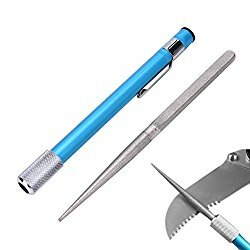 Compact, this tool packs easily and is simple to maintain a grip so you can sharpen precisely and safely. Gatco 40001 Carbide Pocket Sharpener is built tough to survive time out in the field hunting, and it’s quick and safe to use. To move on from the reviews of our recommended products, you may still have some questions or concerns about sharpeners for your hunting knife. If so, the following address some of the more common inquiries people like you have to further help you learn more about these sharpeners and how to pick out the one that better suits your needs. Determining the best knife sharpener isn’t easy as different knives can require different care. Some are good for serrated, others for standard edges, and others can even handle both. In any event, the best type is one that offers enough versatility where you can get various angles so you’re not limited in the blade you can sharpen. Also, for hunting purposes, it should have good durability to withstand the outside elements. Also, it should hold up for a good amount of time and be easy to use. 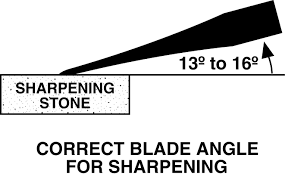 The best angle for knife sharpening varies based on what you’ll need it for. Since you’re here for hunting purposes, you want an angle that sharpens enough to protect the blade from abuse. For instance, anything angled 22-degrees and higher will provide a considerably sharp and durable edge, which is ideal for hunting. How often do you need to sharpen a knife? First, all knives need to be sharpened to extend their lifespan. When you’re hunting, having a dull edge can make things considerably difficult. Even so, there is no set limit on how much you can use a knife before having to sharpen it. Rather, when you feel it’s dull, get to sharpening. You can tell it’s dull if you struggle with routine tasks like skinning an animal. A good knife sharpener for the field comes in handy to quickly give new life to your blade and provides a sharp enough edge that lasts a good deal of time. What’s the difference between honing and sharpening? You may have heard both “honing” and “sharpening”. If they’ve confused you, take comfort in the fact that you’re not alone as the words do have similar meanings when it comes to making knives have a sharper edge. To answer as simple as possible, honing is maintaining an already sharp edge while knife sharpening tools focus on grinding material away to create a sharp edge. What is the best sharpening steel? There are a few materials used in knife sharpeners. However, some do stand out higher than the rest. Diamond is generally a popular and go-to choice for many considering that it’s among the hardest material used. Sharpener for knives that use diamond-coated finish is often among the fastest, which is a good feature if you want something done quickly and effectively. After exploring our top 10 reviews, we recommend Smith’s PP1 Pocket Pal Multifunction Sharpener as the best hunting knife sharpener. It’s great for use while you’re out on the field due to how lightweight it is, and it works well whether you have standard edges or serrated edges. 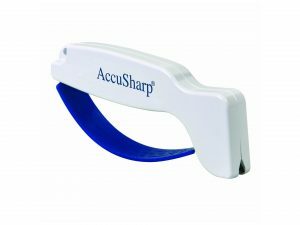 AccuSharp 001C Knife Sharpener: Ergonomic handle that’s quick and easy to use. 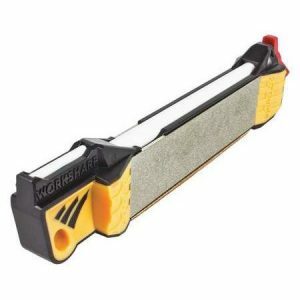 Work Sharp WSKTS-W Knife & Tool Sharpener: Quick sharpening for a long-lasting edge. Sharp Pebble Premium Knife Sharpening Stone 2 Side Grit: Double-sided stone that uses water. Presto 08810 Professional Electric Knife Sharpener: Minimal noise and three sharpening levels. Smith’s CCKS 2-Step Knife Sharpener: Compact and lightweight for good portability. Work Sharp Guided Field Sharpener: Consistent and fast sharpening. 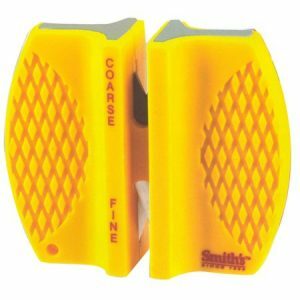 Smith’s DCS4 4-Inch FINE & COARSE Diamond Combo Sharpening Stones: Fine and coarse options with soft rubber grip. DMT FWFC Double Sided Diafold Sharpener Fine/Coarse: Durable two-sided construction. Gatco 40001 Carbide Pocket Sharpener: Hard-coated and provides a precise edge.